Nick Garside. Democratic Ideals and the Politicization of Nature: The Roving Life of a Feral Citizen. Palgrave Macmillan US: New York, NY, 2013. 198 pp. $100.00 Hardcover, ISBN: 978-1-137-00865-7. $95.00 Softcover, ISBN: 978-1-137-00865-7. $79.99 E-book, ISBN: 978-1-137-00866-4. 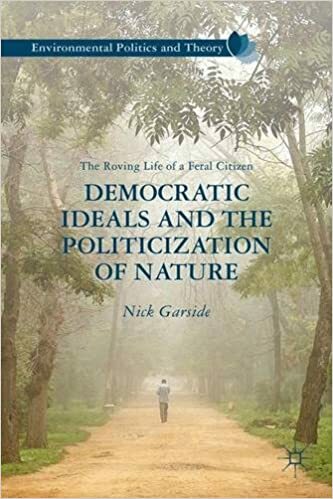 In Democratic Ideals and the Politicization of Nature: The Roving Life of a Feral Citizen (2013), Nick Garside imagines a “feral citizen” employing mobile, disruptive creativity in the service of radical democracy. Garside recognizes that democratic governance is generally accepted as right and good but criticizes it for not having revitalized public space, challenged institutionalized authority, or adequately rethought social relations. In Garside’s critique, passive and pacified citizens of representative democracies are stuck with “procedural statecraft” benefitting liberal economics (1). Even contemporary social movements, including the environmental movement, strive for increased legitimacy and tension-free relationships over the ideals of liberty and justice. Along comes the feral citizen, a disruptive wanderer, to shake things up and move on, disturbing but not destroying stagnant communities. The feral citizen appreciates politics—including green politics—for their antagonism and uncertainty and plays in the space of indeterminate struggle. Garside’s hope is that feral citizens will resuscitate moribund representative democracy, but concrete examples of how this might look are few and far between in this philosophical work. In contrast to passive voters whose choices have been made for them long before they step into the voting booth, feral citizens, inspired by England’s Ramblers, Baudelaire’s flaněur, and the Situationists of Paris, can revitalize static democracy because they operate outside of “controlling norms and institutions,” visiting and inciting sedentary communities (17). Garside expresses interest in a greater role for unprofessional politics practiced in free and creative spaces where democratic instrumentalism is critiqued as a “treadmill” so monotonous it drains citizens of their spirit (16). Garside’s political wanderers are motivated by their discomfort with apathetic society that focuses on personal pleasure in commodities peddled by the “media, economy, and state apparatus,” a society where “most are unaware of their status as subjects of tyrannical control” (35). In contrast to stultifying administrative demands, ambulatory feral citizenship offers the chance for close observation, active listening, and storytelling. According to Garside, a 2000 study by Herbert Reid and Betsy Taylor found that Appalachian mountain residents consider walking and storytelling to be types of environmental activism. Garside greets this study exultantly, as it demonstrates “that there remain traces of joyful citizenship among those not as explicitly, or at least differently subjected to capitalist and statist relations” (135, italics in the original). Although he doesn’t label those living in Appalachia “feral citizens,” Garside salutes Reid and Taylor’s research for paying attention to uncommon ways of practicing green citizenship beyond goal-oriented environmentalism. Garside acknowledges the debt he owes to public realm theorists, especially Habermas, Mouffe, Arendt, and Castoriadis, for assisting his “development of feral citizenship as a joyful adventure through the wilds of democratic theory and practice.” However, he considers democratic terrain a “tough walk” for the environmentally-minded who have narrowed green citizenship to “instrumentalism and end-focused intention,” thereby limiting its “disruptive political promise” (108). Readers coming to this text from a mainstream environmentalism or ecology perspective may be rudely awakened by Garside’s critiques of the stewardship ethos and the caring ethos. From Garside’s politics-first perspective, it’s far more important for the green citizen to make certain that green issues and representations of nature are included in the public discourse than to reach a goal of, say, sustainability. Reading Garside’s book can be a challenging trek for those who prefer pragmatic how-to advice for environmentalist participation, but the book is an excellent journey for experienced hikers through green philosophy. Garside does salute the Arab Spring, the Occupy movement, and Europe’s anti-austerity uprisings as examples of feral citizenship because “the demands, desires and actions of these movements transgress the capacity of the state to respond,” considering these movements “the most promising enactments of democracy” since the anti-globalization movement at the turn of the last century (91). While Garside’s tone is often grim when he reflects on contemporary deliberative democracy, he can be exuberantly optimistic when imagining the upheaval possible in a feral citizenship not looking for answers or tension-free collaboration. Democratic Ideals and the Politicization of Nature is for those desiring a deep, intellectual approach to democracy that embraces the nonhuman and the human in an ethos of respect and liberation with no expectation of frictionless relations. Garside does a fine job questioning popular assumptions about humankind’s ability to “know” nature and expands green political discussion in a way that takes readers on a journey far outside the predictable instrumentalism of reducing, reusing, and recycling. 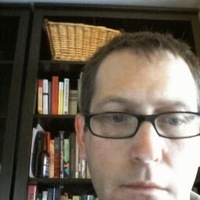 Nick Garside currently resides in Ontario, Canada and is a professor at Wilfrid Laurier University at their Brantford Campus location. This is his first book publication, though, he has published a number of papers and theses.